The ferry docks at the South side of the Skagway Small Boat Harbor. From the covered restroom pavilion, follow the wooden pier to the blue awning covered ramp. Once on the floating dock, continue along the dock to the end. The ferry will be docked along the end of the floating dock. A representative will be there to assist you 15 minutes prior to departure. 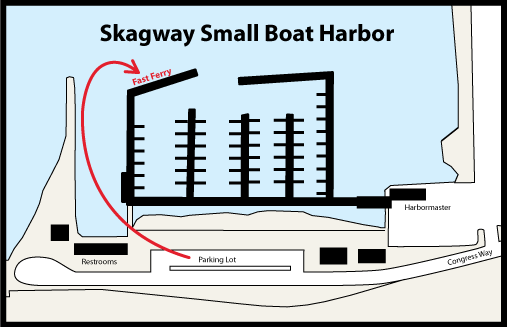 Free parking is available at the Skagway Small Boat Harbor. Please be mindful of reserved areas and time limited parking as noted by the posted signs. 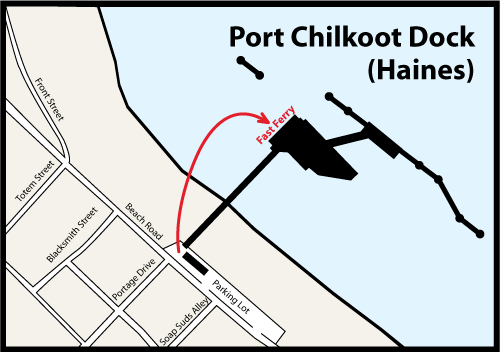 The ferry uses the Port Chilkoot dock. From the parking lot, pass the restrooms and continue along the pier. To your left, there will be a blue roofed ramp that leads down to the floating dock. A representative will greet you at the top of the ramp. For your safety and those of other passengers, please do not wait for the vessel on the floating dock. Passengers will need to offload and move up the ramp before you can board the vessel. Free parking is available at the end of the pier in Haines. 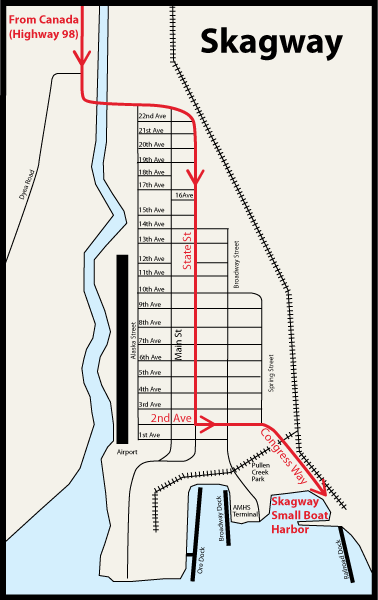 Please be mindful of reserved areas and time limited parking as noted by the posted signs.